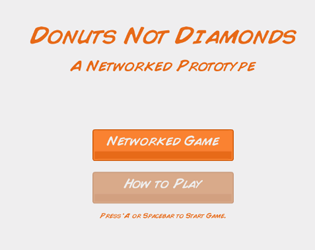 This is a silly prototype using TrueSync from Exit Games to try and create a networked game. Requires to players on two different machines with internet access. Should work with my USB controllers (or the keyboard). It's pretty simple: 4, 10-second rounds to try and collect as many donuts as possible while avoiding diamonds! Download the .zip, unzip, and run the .exe. Do not put the .exe in a different folder than the _Data folder!